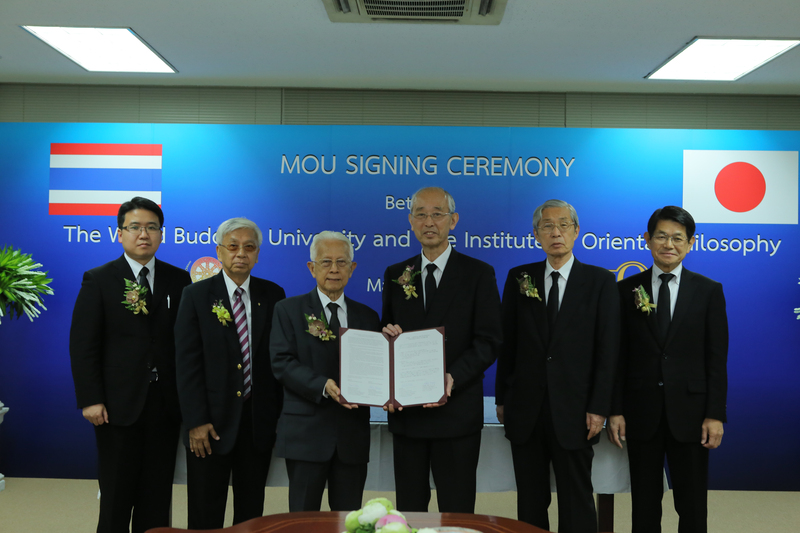 For the academic exchange agreement between the World Buddhist University (WBU) in the Kingdom of Thailand and the Institute of Oriental Philosophy (IOP), an MOU signing ceremony was held on May 3, 2017 at the Headquarters of Soka Gakkai Thailand (near Bangkok). Dr. Noranit Setabutr, Chairman of the WBU Council, and Mr. Akira Kirigaya, Director of IOP, attended the ceremony with other concerned members. After the Oxford Center for Buddhist Studies and Center for Civilizational Dialogue, University of Malaya, WBU is the 10th institution which IOP has concluded academic exchange agreements with. To date, WBU and IOP have affirmed their commitment to advance Buddhist studies through events including the symposium “Global Challenge Facing Humanity and Buddhism” held in March, 2017. It is highly expected that this agreement will drive both institutions to continue their active exchanges in the future. At the ceremony, Dr. Noranit expressed his wishes to advance together in search of the wisdom that Buddhism brings forth. Copyright © The Institute of Oriental Philosophy. All rights reserved.